Mayor Domenic J. Sarno, Park Commission Chairman Brian Santaniello, Executive Director of Parks, Buildings & Recreation Management Patrick J. Sullivan, Director of Capital Asset Construction Peter Garvey, Chief Development Officer Kevin Kennedy, President of Springfield Museums Kay Simpson, and President of Related Beal Kim Sherman-Stamler announced that the Pynchon Plaza renovation project is slated for public bid. 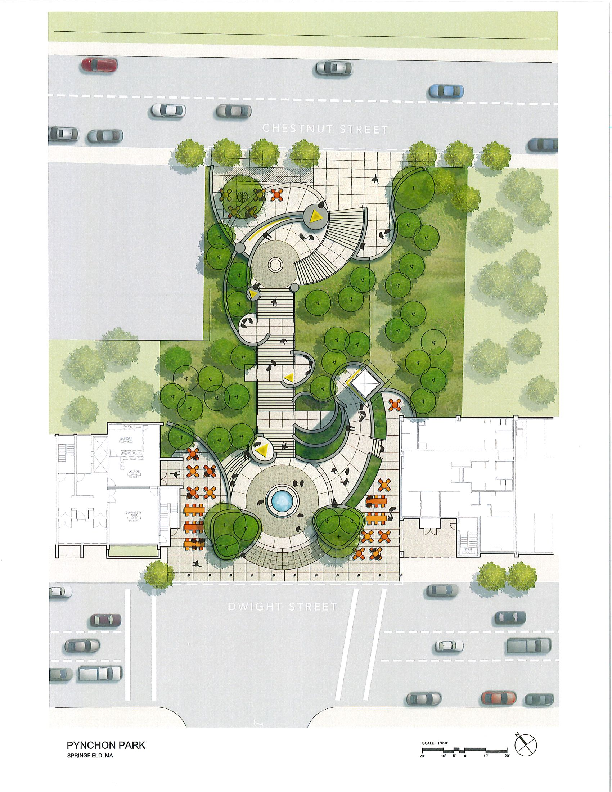 Mayor Sarno has approved plans for the renovation of Pynchon Plaza and has submitted the plans to the Springfield Park Commission for their approval at their January 24th meeting. The four million dollar renovation, made possible by a grant from MassWorks and funding from the City of Springfield, includes a new staircase connecting Chestnut Street to Dwight Street, a new ADA elevator, as well as plantings, lighting, security cameras and outdoor space that will complement the proposed improvements being completed by Related Companies, which owns the two adjacent properties to Pynchon Plaza. Adding a level of comfort and security, the Springfield Police Department has opened a substation at the Dwight Street entrance to the park. The substation build out was completed by Related Companies with build out costs totaling $750,000. Mayor Sarno stated, "The renovation of Pynchon Plaza sends a strong message that the City of Springfield is working in conjunction with the Commonwealth of Massachusetts to secure the resources necessary to preserve our downtown area. We are excited for this opportunity to bridge our world-class Museums to downtown, and the proposed improvements will be an important welcoming gateway.” The Mayor credits the Planning Department, Park Department, the Museums and Related Companies in working collaboratively to revitalize this park. Park Commission Chairman Brian Santaniello asserted, “The restoration of Pynchon Plaza is an exciting venture and is another example of the community becoming involved with the park system in efforts to preserve Springfield's open space.” Mr. Santaniello praised the Museums and Related Companies for offering their assistance during the design of this park.